American Car Brands With Best and Worst Customer Service - 24/7 Wall St.
Service is a critical issue for customer satisfaction, and new research released this week shows a very wide range of satisfaction for car brands. The research also shows how service can be either improved or undermined by how well dealers handle owners. The results of the study showed that Porsche had the best customer service among brands sold in the United States and Fiat had the worst. The J.D. Power 2019 Customer Service Index study, released today, divides brands into “luxury” and “mass market” categories. 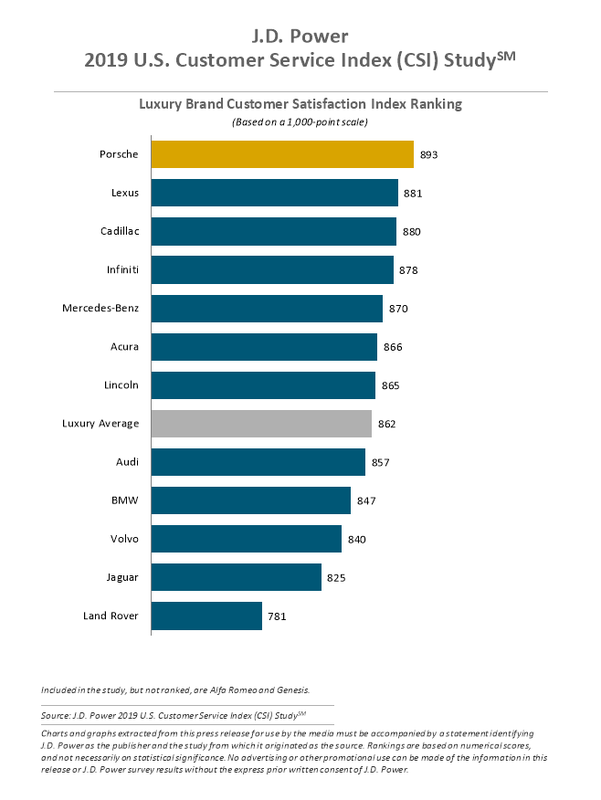 Among luxury brands, Porsche’s first place position (with a score of 893 out of a possible 1,000) was followed by Lexus (881), the Toyota luxury brand, then GM’s Cadillac (880) and Nissan’s luxury division Infiniti (878). Land Rover was at the bottom of the luxury list (781), slightly below Jaguar (825). Both are owned by Tata Motors. Among mass market brands, GM’s Buick ranked first (857), followed by BMW’s Mini (853). Fiat Chrysler’s Fiat brand was ranked worst (743). It was joined by four other Fiat Chrysler brands in making up the five worst. Ram (783), the company’s pickup brand, was slightly better than Fiat. Jeep (803) was the third worst in the mass market category, Dodge was the fourth worst (804) and Chrysler was the fifth worst (805). The study asked 57,286 owners and lessees of 2016 to 2018 model-year vehicles about five aspects of service. The study was conducted between October and December of last year. J.D. Power broke service into five categories and then weighted them to create the grades. For what it calls the “vehicle owner service experience,” J.D. Power included service quality with a 27% weighting; service initiation, which was weighted at 20%; service advisors, also at 20%; service facilities were at 17%; and vehicle pickup was 16% of the grade.